Osgood Schlatters disease is an inflammatory condition which affects the insertion of the patella tendon into the tibia (shin bone). Osgood Schlatters is a common cause of anterior (front) knee pain in adolescents. It is caused by repetitive activity (such as jumping sports- eg AFL or Basketball), where the strong patella tendon is pulling away from the growth plate (which is weaker) at the front of the knee (tibial tuberosity) and is also referred to as an ‘apophysitis’ or growth plate inflammation. 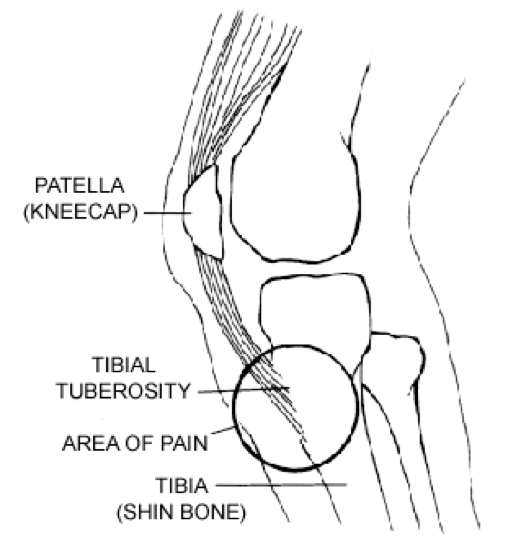 Osgood Schlatters disease affects the insertion of the patella tendon into the tibial tuberosity (circled).